Sean Dyche accepts his side are giving away “too many soft goals”. But he felt his side deserved a point at least against Newcastle United, who claimed a 2-1 win. A fortunate opener for the Magpies, as Ben Mee inadvertently deflected in a shot from Federico Fernandez which was going wide, was backed up by a headed second from Ciaran Clark. Sam Vokes looped in a header just before half-time from the edge of the area, but while Chris Wood had a number of second half openings, Newcastle missed glaring chances as Matt Ritchie produced the miss of the season from two yards, and Joselu hit the post. 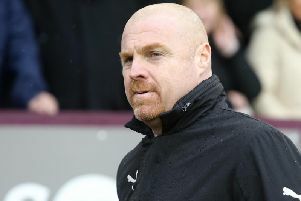 Dyche said: “I think we deserved something, I think a lot of aspects of the game I was very pleased with, and certainly the amount of quality chances. “It’s not easy to do that in the Premier League, and I’ve said many times we’ve been close to being effective with those chances, and tonight they were really good chances. “And I’m pleased with the way we mixed our play to make those chances. “Obviously the frustration is we didn’t get a result, and we need to get on the right side of the margins, but we also need a scratch of luck - their first goal gets a hell of a deflection, and that would be a pleasant thing to happen to us. “And the mentality I’m very pleased with, the fact is we’ve kept going and going, searching for a chance to not only draw, but try and win the game. “Woody’s had chances, Vokesey has, even in the dying seconds, so I think the character of the side is coming back, the energy of the side was very good, and some of the quality, some of the play was really good. Burnley had started at a good tempo before falling behind, and Dyche added: “I thought we started with the ball really well, we were dominating possession, and we get a really poor goal against us, a lucky goal to be fair. We dealt with the first part, and it gets a big deflection. “The second goal was really poor, that’s stuff we’re good at. It’s a good ball in, to be fair, and a good header, but I think we deal with that most times, and particularly last season. “On the other hand, after that, I thought the mentality got stronger and stronger, and we rightly scored a good goal, could have had an equaliser. And he felt his players created enough to earn a result overall: “It was a great header from Vokesy, I thought we mixed our play well, against a 5-4-1 it’s really tough, and they’ve done that a lot this season, camped in and looked to counter, and we knew they might do that, it was either a 4-4-1-1 or 5-4-1, and when we saw the team we thought it was a five. “Then you are searching for ways to break those numbers down, particular when they get their noses in front. “And I thought we did that well, Woody has played well, he had a couple of really good chances, and Vokesy as well, it’s frustrating beyond the result, because I think we’ve given a performance. “I’ve said I think that’s been coming back, and I think it is, the way the players have gone about the performance is very good. Asked if Burnley were still not at their recognised levels, Dyche countered: “There’s a lot more signs of it, the stats will stat up well tonight, we don’t use that as a literal marker, but that has to go into the thinking, our eyes tell us there were lots of good things, but inevitably, you have to win games, we know that. “We’ve got to turn good performances into wins, or certainly points, but I think that’s another sign of that mentality coming back.